Gun Runner waved goodbye to his legion of fans with a shake of his red tail, and the chestnut son of Candy Ride has arrived in Kentucky to enter stud at Three Chimneys Farm. Bred in Kentucky by Besilu Stables LLC, Gun Runner was foaled and raised at WinStar Farm, then sold privately to Winchell Thoroughbreds LLC and Three Chimneys Farm. At the 2011 Keeneland November sale, Ben Leon's Besilu Stables purchased the dam, stakes winner Quiet Giant (by Giant's Causeway), for $3 million out of the dispersal of stock from the estate of Edward P. “Ned” Evans, who bred and raced Quiet Giant. Gun Runner is the mare's first foal. 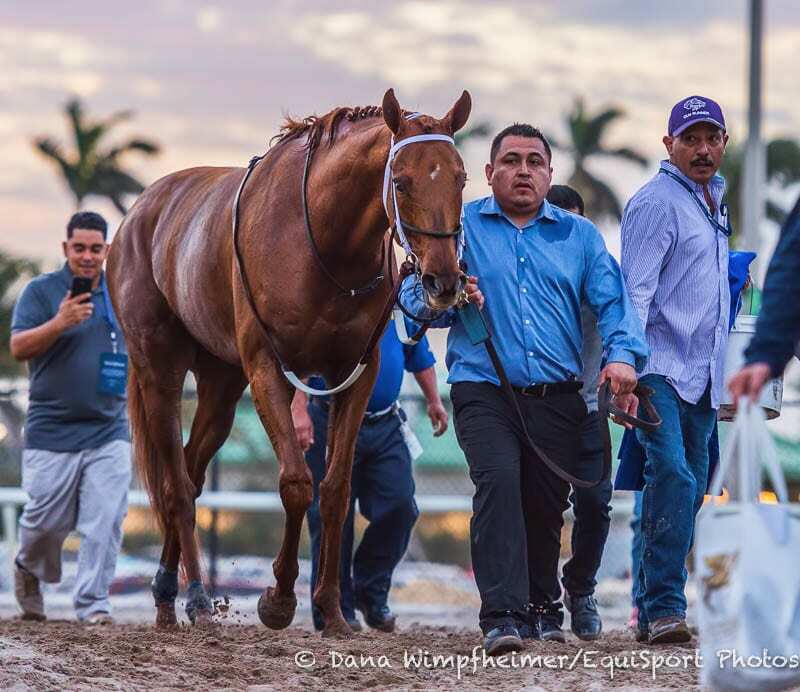 Part of the historical interconnections of racing that run through the saga of Gun Runner is the influence of Ned Evans on racing and breeding, and the man who's long had a hand in this family is Chris Baker. For 11 years, Baker was general manager for Evans at his farm in Virginia and is now chief operating officer at Three Chimneys. As such, Evans wasn't afraid to cull. When he cut a good one loose, he wasn't too proud to step back in the ring and buy an animal that had proven its worth. This happened repeatedly with Gun Runner's family. Evans bred and raced Gun Runner's dam Quiet Giant and raced Gun Runner's second dam Quiet Dance (Quiet American). Evans acquired Quiet Dance as a yearling at the Fasig-Tipton Saratoga select sale for $75,000. A useful racemare who won the restricted Gala Lil Stakes at Pimlico, Quiet Dance also ran second in the G2 Demoiselle Stakes at 2. After her retirement to Edwards' Spring Hill Farm in Virginia, Quiet Dance became a broodmare of exceptional significance. The dam of four stakes winners, Quiet Dance also produced three stakes-placed performers, a winning daughter who is the dam of G3 winner Lull (War Front), and an unraced daughter who is the dam of G1 winner Buster's Ready (More Than Ready). Among the mare's four stakes winners, the best was unquestionably Horse of the Year Saint Liam (Saint Ballado), with Quiet Giant ranking second as a G2 stakes winner herself. Saint Liam won nine races and more than $4.4 million, and he nearly mirrored the racing record of his kinsman Gun Runner with victories in the G1 Breeders' Cup Classic, Donn (Pegasus), Clark (then a G2), Stephen Foster, and Woodward. Gun Runner also won the G1 Whitney and G2 Louisiana Derby. Evans bred Saint Liam and sold him for $130,000 at the Saratoga select yearling sale. That was a profitable transaction, but the horse went on to become a champion and earn $4.4 million. Champion as a 5-year-old, Saint Liam stood only one season at Lane's End before his death, but the bay sired champion Havre de Grace, among others. Gun Runner differs from his elder relative by having a faster cruising speed and by coming to hand earlier so that the son of Candy Ride challenged his divisional rivals earlier in his career, winning the Louisiana Derby before finishing third in the 2016 Kentucky Derby and Travers, then winning his first G1 in the Clark at the end of his 3-year-old season. Members of this family have shown high form at 2, as well as later in their careers, and Quiet Dance had been second in the G2 Demoiselle at 2 in 1995. After Quiet Dance had shown her form, her dam Misty Dancer went to the sales, and Evans paid $230,000 for the dam of his successful Saratoga sale purchase at the 1996 Keeneland November sale when the mare was 8 and in foal to Silver Hawk (Roberto). Retired a maiden after three excursions in maiden special weight company, Misty Dancer was by a first-rate sire and broodmare sire in Lyphard and out of an excellent producer, the Misty Flight mare Flight Dancer, who produced two high-class racers, Misty Galore (Halo) and Minstrella (The Minstrel). At one point, Evans owned Flight Dancer, a granddaughter of champion Gallorette, but sold her after she had produced Minstrella, who won the G1 Cheveley Park Stakes and two other G1 races, and she was a highweight at 2 in England and Ireland in 1986. Then Evans sold Flight Dancer before she produced Misty Dancer. But he liked Misty Dancer's daughter Quiet Dance enough to purchase her as a yearling, then when the daughter revealed her form, Evans purchased the dam as well. If you love a tangled tale, this is your ball of yarn. But wall to wall, it is a tale of good horses. This entry was posted in Bloodlines, Bloodstock, NL List and tagged Bloodlines, Breeding, Frank Mitchell, gun runner, Ned Evans, pedigrees, sires, Thoroughbred breeding, thoroughbred pedigrees, Thoroughbred sires by Frank Mitchell. Bookmark the permalink.